There’s something that a lot of Econet broadband subscribers have noticed in the past couple days. 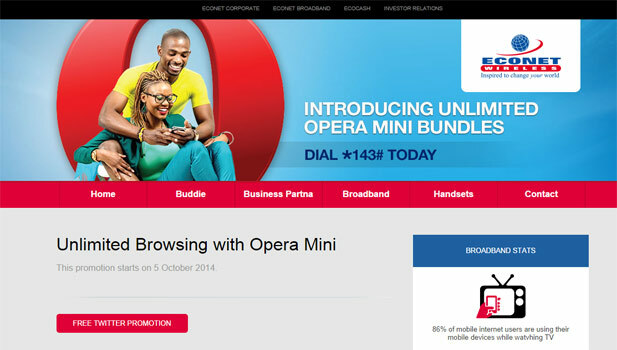 Econet has been advertising its latest service that was launched at midnight– An unlimited browsing promotion via the Opera Mini browser. By dialing *143# subscribers are able to select an option for unlimited browsing for 24 hours which costs 40 cents or a 3 day period which is pegged at 95 cents. This offer does not extend to downloads and any links that direct a subscriber off the Opera Mini browser. Econet has been in bed with Opera Mini before. Initially it was with a skinning of the Opera Mini browser that placed the Econet homepage as one of the bookmarks on the browser homepage, a move that Telecel pioneered back in 2012 together with free Facebook access. This time Econet is out to monetise the popularity of Opera Mini, The browser is a preferred option for local, price sensitive mobile subscribers and the networks because it economises data use and is highly compatible with feature phones that make up the majority of the current mobile market spread in Zimbabwe. At the end of the day it’s a win-win for Econet which, like every other network operator,is trying to create new cash streams in a business matrix that has receding voice revenue. So what’s the catch here? What’s with the generosity from Econet all of sudden? First free Twitter now this? Are we really getting that “focus on value” commitment that is now the new Econet promise to its millions? The thing is Econet gets to place a premium on a service that is already popular with their broadband subscribers but is supposed to be free anyway, package it neatly as a “promotion” and maintain certain Ts and Cs that protect the network from “abuse” (no downloads, links off Opera come at a premium). This is just like how Facebook and WhatsApp that are meant to be free (albeit with the general data cost) actually cost subscribers a total $6 a month. Now with this new promotion there’s going to be an additional $9.50 per month from every willing subscriber courtesy of Opera Mini. The end result is Econet’s ARPU shots up and so do revenues from broadband use that is set to be the new cash frontier now that the era of super profits from voice revenue is drawing to a close. Yes, Econet still assumes some responsibility because the browsing still costs something to the network. But who are we kidding here. The “burden” of a free internet and OTT data services which is proving to be a challenge for networks is coming to our doorstep disguised as promotions that cost us rather than spare us. It doesn’t look like there’s any relief for an overtaxed Zimbabwean subscriber. Data services that have been expensive all along will always be expensive, they just found a different way to make you pay for it all. It’s still a pig, they just put more lipstick on it. Idk but I was able to download all night since around 2am. U reckon I will be charged later for these downloads? I doubt they will retro-charge. Personally I am milking the 1-4Mbps i am getting and pulling down as much data as i can before this little loop hole is closed! econet shld gv us something that is truly free. We are not 100% ignorant of these disguised promotions. Last time I checked, they were in this business entirely for profit. Not to say they can’t do better, but no viable business idea involves going around handing out freebies without a catch somewhere. On another note, I would like to see Econet offer unlimited packages for things like Google Apps and YouTube. I would be more than happy to shell out $10 a month for unlimited Gmail, Youtube, Google, Google Drive, play store etc. snc i strtd 2 use Ecconet, it is lyk i’m using 4 free as comparing to other nnetworks, dis is more dan a frand!!!! positive move from Econet. Handikusiyei kusvika mandifadza. Good article but i think you need to explain the acronyms you use . Or maybe you have some audience you target who understand these. ARPU? OTT? OMG, an article with Econet and generosity in the same sentence! Econet is going all out to try and maintain revenue flows. While they try the TNManagement Method (A bank teller, a bottle of mazoe, a ladies blouse, a coffee table and a queen cake in the same shop) by launching Ecoschool, Ecofarmer, EcoSolar, EcoCash to look beyond the telecoms industry for rich pickings all this removes from their primary business focus. I fully expect to hear EcoCement, EcoDogfood and EcoYakiBraid to be launched at some point. The money being used on these pet projects could be better spent giving us cheaper handsets than the usurious ones in the full color supplement in the paper today. There are already players in those other industries and they shouldn’t try to be all things to all people. What do you mean Ecocash is studied at Universities? Which Silly University has a subject called EcoCash? I guess mud huts are also studied at Universities since they get a mention there….according to your logic. It doesnt do facebook their new package! Darn it! what they need is proper broadband and reasonable prices. last time I was in zim, the network was so bad and the prices were so high. Econet has always been too loud even on things overdue, whilst being a bit like innovative in ideas in Zimbabwean communications all they do is fleece subscribers under the guise of newbies etc. Imagine i’m paying £15 (i.e approx US$25) for unlimited data, 5000 minutes, 5000 texts, unlimited in-network service minutes, Econet can do better to this level and beyond. May I beg to differ… 15 Pounds or $25 for almost ‘unlimited?? This is in UK I presume. And I also presume the MNO offering this has tens of millions of subscribers and have got greater economies of scale compared to Econet. An example: its about $40 – $50 a month in the US for say Verizon customers to get unlimited everything (data, voice, text, everything) and say 50 millions subscribers pay for this, they get $2.5billion each month. Econet would get $50 million each month if they are lucky to get a million subscribers willing to pay $50 every month. And by the way, this $40-$50 packeg from Verizon comes with a good handset like an iPhone (after paying a small deposit of maybe $200). In the end, they are able to offer services at reasonable rates and Econet may not necessarily be able to replicate that financial model. I think this bundle is great. I’m able to download all files below 50MB at reasonable speeds. nothing to write home about…internet speed suddenly took a downward spiral…its better to pay for limited net with gud speed. I downloaded files last night of about 100mb using the Opera Bundle. I begrudgingly tip my hat to you. Good one Econet. Its not so easy to block downloads in that way.Even if they blocked downloads from Opera Mini Browser, you could fake the User Agent Name with a few lines of code and download unlimited files from your computer . I’m pretty sure HTTP doesn’t differentiate a request for a 100kb webpage from a request for a 100GB file. It’s pretty good that we now can spend the whole day on internet.